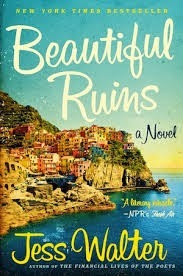 Beautiful Ruins by Jess Walter is a novel that swept across decades in it's scope and featured really well-formed and memorable characters. It included Italian villagers in the 1960s, a fictional depiction of actor Richard Branson and a young American actress, modern day Hollywood producers and a wanna-be Hollywood writer, and an intersection of the various storylines. The title seemed very appropriate as it really was a beautifully written book that featured some very large life decisions made throughout. Intention isn't to give away much of the plot in this post, but a review by Helen Schulman for the New York Times does provide many of the details of what transpires in the book.